Dark Chocolate Peanut Butter Granola with chopped peanuts and honey drizzle! Is there anything better? Okay, you had to know a peanut butter and dark chocolate granola recipe would appear on the blog sooner or later! If you’ve been following for a while, you know that I add dark chocolate to most desserts, and peanut butter is just a staple in my life! If it’s not in a dessert, it’s on toast with chia jam, drizzled on a protein pancake with sliced banana or used as a dip for apple slices. If you need a little reminder of my peanut butter obsession, just check out these peanut butter mounds or these ice cream cookie cups. 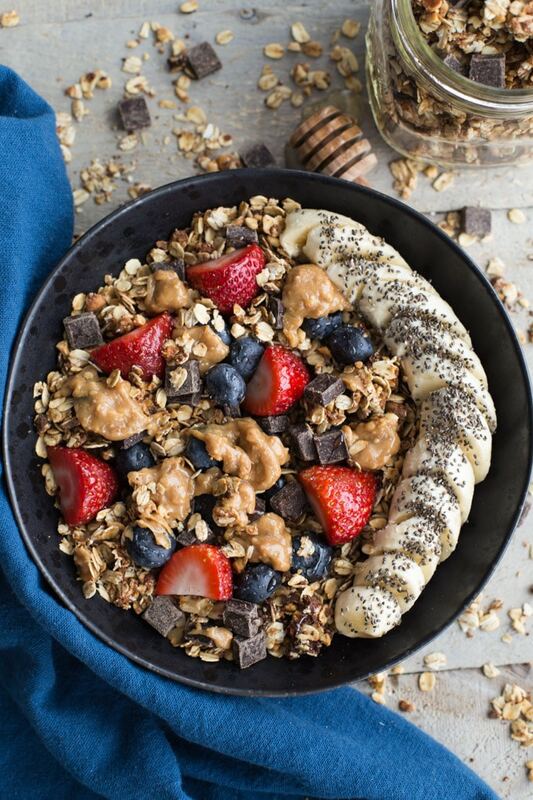 There is a good chance that I eat too much peanut butter…..
And the obsession continues with this Dark Chocolate Peanut Butter Granola. What’s not to obsess about? 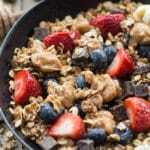 Granola is quick and easy to make, and you can control the amount of refined sugar and other processed ingredients that go into it. Before I started making this peanut butter version, maple walnut granola was on repeat in my house. Seriously, every weekend I was whipping up a batch for the week ahead. Granola is just the perfect healthy snack to have at the ready. It’s awesome with almond milk and fruit for a hearty breakfast, or you can stir it into yogurt for a mid-morning snack. My new fave way is to sprinkle it on toast. (And yes, it’s peanut butter toast!) If you follow along on Instagram Stories, you’ve seen a few of those creations already. 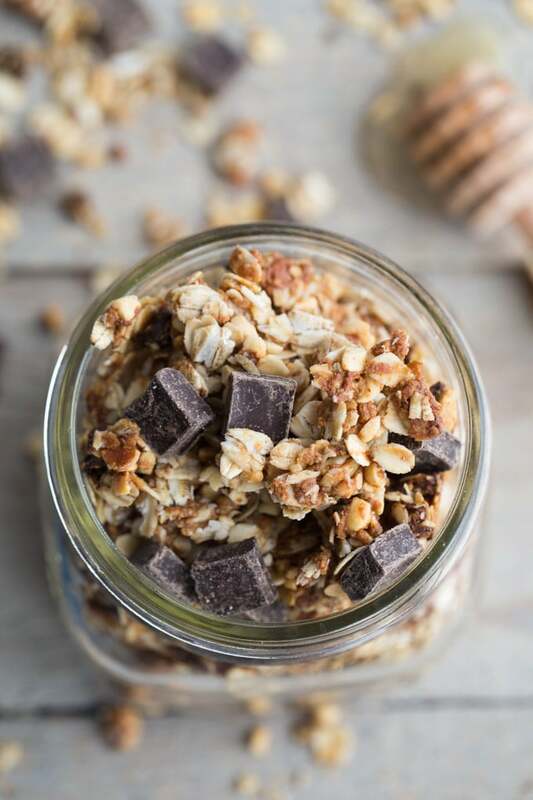 There are no crazy ingredients in this Dark Chocolate Peanut Butter Granola, just rolled oats, peanuts, peanut butter, honey, coconut sugar, sea salt and coconut oil. It bakes into crispy, delicious pieces, and once you add the dark chocolate chunks, it’s hard to tell if you’ve just made breakfast or dessert! This has so much of everything I love! It’s weird. Chocolate doesn’t do much for me, until it’s paired with PB. And then it’s basically game over. I need this in my breakfast routine! Thanks Dawn! I’ve been snacking on this for weeks! It’s a bit addictive! Hope you’re having an awesome weekend! twist on traditional granola. I will definitely have to give this a try, we love peanut butter in our house. 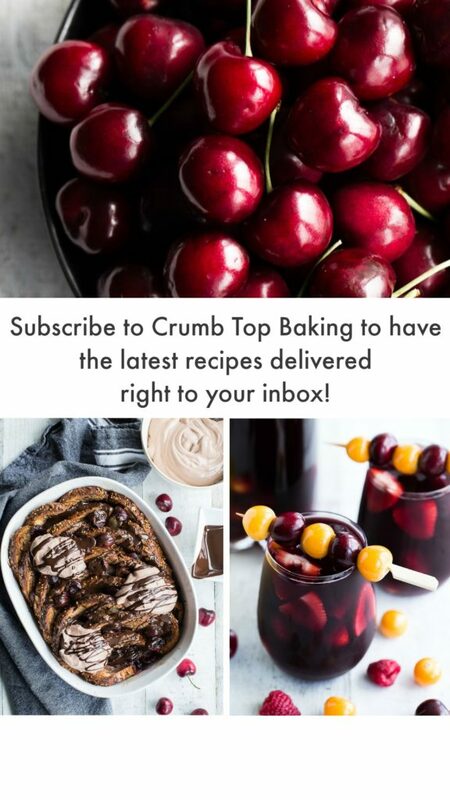 First, this recipe looks amazing. I usually eat eggs for breakfast but I’ll make an exception just to eat this! Second, I implore you to look up Ground Up – the nut butter company based out of Portland, OR. I bought a jar of their “Cinnamon Snickerdoodle” nut butter (made with all natural ingredients) a few days ago and it’s already gone. I think I’m going to try and duplicate the recipe bc their stuff is pricey. I’m pinning this recipe because I HAVE to make it in the near future, it looks AWESOME! Thanks Christina! I hope you like the granola! I will definitely check out the cinnamon snickerdoodle nut butter. Someone on Instagram the other day had incorporated it into a recipe, and it sounded amazing! I don’t think I can get that nut butter in these parts, so if you can replicate the recipe, I’d be all over that! Happy Sunday! Peanut butter plus chocolate equals BEST COMBO EVER! 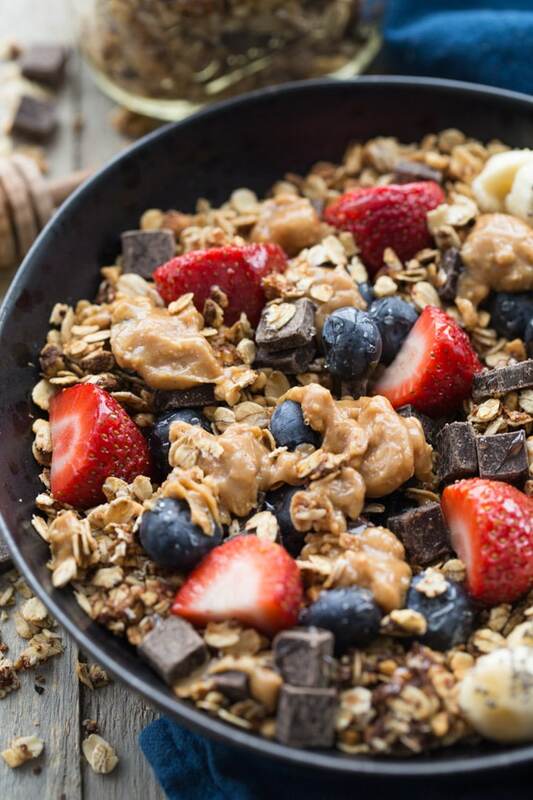 Who wouldn’t want to start the day with this granola! Awesome combo Leanne! I love adding dark chocolate to many things too. And you can never go wrong with peanut butter! I don’t think there’s such a thing as too much peanut butter! Thanks Mary Ann! I totally agree! You can never go wrong with peanut butter! And the dark chocolate is an added bonus! This looks so delicious! Great idea for a quick and easy snack. Those pics are incredible too. Thanks Brian! It’s definitely a quick and easy snack. Perfect for the week ahead! Happy Sunday! Thanks Denise! The peanut butter adds a nice taste and texture to the granola. Hope you get to try it! Thanks for stopping by! Great minds, Leanne! 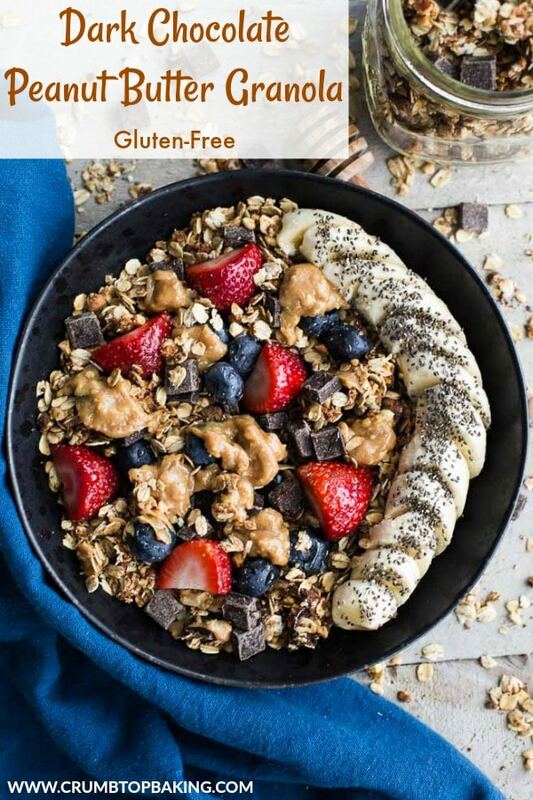 I just snapped a few photos of a peanut butter granola the other day 🙂 I love the dark chocolate in here – I eat dark chocolate every single day, and I’m with you….peanut butter is a staple!! Love this!! Haha! We both love our breakfast foods Katherine! Some overlap in recipes was bound to happen! I can’t wait to see your peanut butter granola recipe! You can never have too many of those! Happy Sunday! Peanut butter and dark chocolate is the name of my game and I’d love a great big bowl! I love all that fresh fruit on top — this looks delicious! Thanks Puja! It’s one of my favourite combos too. Thanks for pinning! Oats and peanut butter make one of my favorite combos. I often add a generous spoon of peanut butter in my oatmeal, sometimes along with a banana and chocolate. So I totally see how these things work in granola too. Delicious! Thanks Ben! Peanut butter in oatmeal sounds delicious too! I’ve also been adding it to smoothie bowls lately. Love the extra protein and creamy texture! 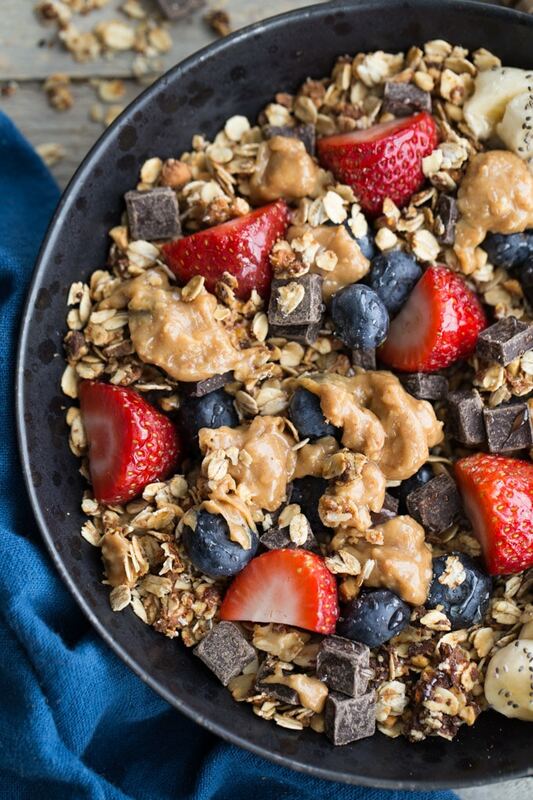 pb + chocolate is such a good combo that i’m not complaining about seeing this (; and love making my own granola! i try to minimize the amount of sugar i’m eating if it’s not dessert, and storebought just has way too much for me. I totally agree Heather. Love being able to control the amount of sugar that goes into homemade granola! Thanks Ashika! I’m getting to the end of my last batch so I’ll need to make more soon! It’s been great sprinkled on smoothie bowls and chia pudding!